Big Brothers Big Sisters of Bucks County - Times Publishing Newspapers, Inc.
At Big Brothers Big Sisters of Bucks County, we know that every child is born with potential. Unfortunately, many children face socioeconomic risk factors, or have experienced trauma, making them more likely to develop academic, behavioral or emotional issues. Our programs match volunteer mentors with children in-need of extra support. At Big Brothers Big Sisters, we know mentoring is not about “saving” children. It’s about igniting, empowering and defending their potential. In our Community Mentoring program, Littles are given quality one-to-one time, twice a month, with a caring adult who is willing to listen and engage the Little in a variety of activities in the community. The average age of our Littles is 12, and the average age of our Bigs is 44. Our Hispanic Initiative matches children of Hispanic heritage with adult role models. The goal of the program is to help American-Latino children embrace their ethnic identities, while also building relationships within the community. In our STEM School Mentoring program, students in grades K-12th are matched with volunteers who visit their “Littles” weekly at their school for an hour. BBBSBC provides a bin filled with STEM-focused games and activities for the matches to use, to help build the students’ interest and skills in Science, Technology, Engineering and Mathematics. 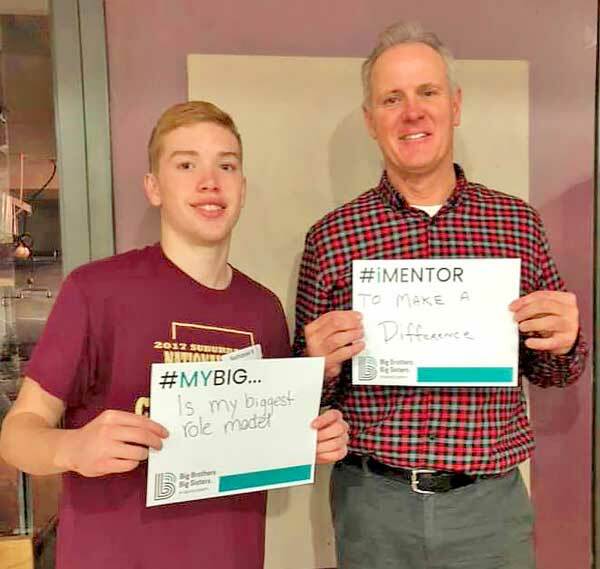 In our High School Bigs program, outstanding high school students are matched as mentors to elementary school students in their district. The “High School Bigs” and their “Littles” meet weekly at the elementary school. The high school students receive leadership education and training, and experience the value of community service. The younger students benefit from having role models who encourage and inspire them. In our “BLAST” (Bigs & Littles Autism Support Team) program, two specially-trained High School Bigs are matched with one elementary-aged Little who has been diagnosed with Autism Spectrum Disorder (ASD). BBBSBC staff provides training, support and coaching to the High School Bigs, specific to meeting the needs of children with ASD. This program is in Goodnoe Elementary, in the Council Rock School District. We have 220 kids on our waiting list who want to be matched with a mentor, and 65% of them are BOYS. There is no age limit for being a mentor. Consider donating your time or money to help children achieve their POTENTIAL! Big Brothers Big Sisters of Bucks County is located at 2875 York Road, Jamison, PA 18929. Call them at 215-343-8260 or visit www.bbbsbc.org.